The most awaited feature is now live! I’m happy to announce that using WooCommerce Serial Key, you can now generate a separate serial key per product quantity. This feature will now be available from version 2.1.0 onwards. As shown in the above image, you can now have five serial keys for five Smart Manager quantities, one serial key for each Smart Manager respectively. Some of our customers wanted to generate a different serial key for each product quantity they were selling. But with WooCommerce Serial Key’s earlier version, it was not possible. WooCommerce Serial Key was generating only one serial key for one product, irrespective of the quantity of the product. For example, if you purchased three quantities of Smart Manager, a single serial key would be issued for all the three. So, we realized the need to build a feature that handles the above problem and finally, we released it in our latest version. Let’s say a WooCommerce store is selling an Antivirus software. If someone purchases 5 copies of that Antivirus software, it’s not recommended to share a single product key that works with all the 5 copies. It might create a lot of complexities for the store to manage product keys. Also, the customer may be resistant to share the same product key with someone else citing security issues. If the customer gets a separate product key for each copy, he won’t need to share that product key with others. WooCommerce Serial Key version 2.1.0 will generate a separate serial key for each quantity of the product purchased. One of the best parts of this feature is that this doesn’t require any additional settings. This feature will become active once you install/update WooCommerce Serial Key 2.1.0. Store serial keys in a structured way. Make serial key management a lot easier. Your customers will also find it useful & safe as they don’t need to share their serial key anymore. What will happen to WooCommerce stores using an older version of this plugin? 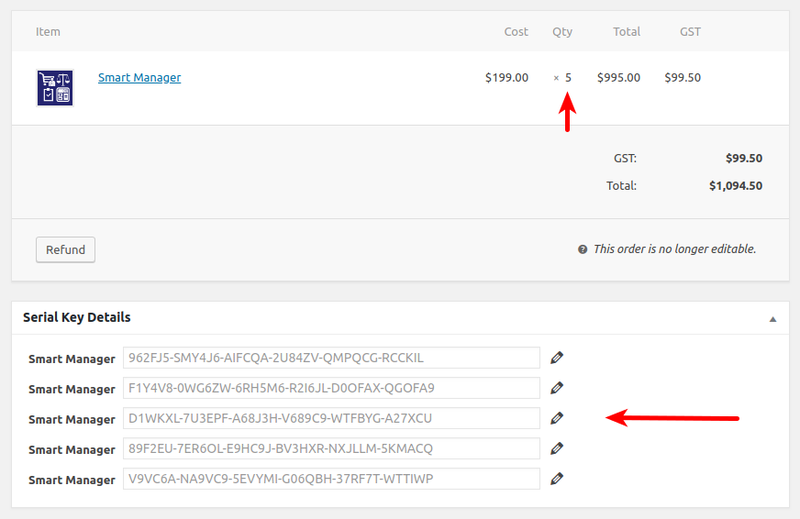 On the admin side, a link “Generate” will appear under an order for each quantity of product. On clicking this link, the plugin will generate a serial key for each quantity of the product. If you are an existing WooCommerce Serial Key user, update it to the lastet version. I’m sure you will like this feature. If you are a new customer, you can purchase WooCommerce Serial Key here. Waiting for your thought on this! Customize WooCommerce Emails – what, why, how-to?